The ban was enacted before this week and the player was not allowed to play in the week 5 match. Roster locks for Advanced, Main, Intermediate, and Open divisions will happen next week. For those that remembered the medal vote between Option 1 and Option 2, where Option 1 won (Special thanks to River, Witness and EmperorFaz), we are proud to announce that the medals are in the game and should ship in the next update. Once this goes live, we would appreciate everyone be patient as we work to distribute the medals. 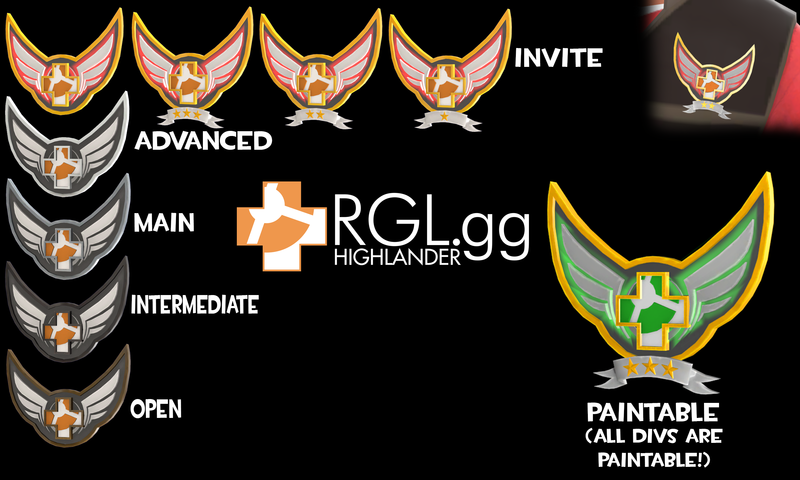 Any concerns or issues should be sent in our #help channel in the RGL HL Discord. The Experimental HL Cup medal design is on the process of being finalized. Details on that will be released as soon as it is done. As noted in our Invite structure changes article, the division will feature wildcard weeks for week 6 and 7, before resuming the official playoffs from week 8 and onwards. In the first part of the RGL HL S2 article, we planned to push for an Invite playoff bracket with a prize pool. Payment will be done differently, with each team having a team fee of $99. Once a team is paid up, all rostered players (including) substitutes are eligible to participate in the playoff matches. If a team that qualifies for the top 4 bracket is unable to front the entry fee to the tournament, we will look to the other seeded teams to see if they would be able to instead. Please contact either exa_ or Dimento regarding any possible payment questions. Fast Forward will play the Flow in the first wildcard match. Wildcard 2: Space Force will play the winner of the first match. The top 3 Invite teams have been confirmed into playoffs and will be awaiting the winner of the wildcard matches. When this does occur, the first seed will play the wildcard winner and the second seed will play the third seed in a double elimination playoff structure. For players that may be unfamiliar, there is still a bug where medics are able to continue healing a player during a pause. This allows the medic to build ubercharge. We insist that server owners update their servers with this updated pause plugin which prevents this from happening. NOTE: During installation, please remove the updater.smx plugin file. A fixed version will be released in the future. For teams that abuse this exploit, disputed rounds may be replayed and/or punishments will be given to teams and players accordingly. Please use the match comms to coordinate any ringers or concerns you have with the match to properly document your needs. Without proper documentation, it makes our jobs as an admin much harder, and we want to be as fair as possible in the spirit of competition. If you have anything that is sensitive or extremely important, do not hesitate to message your division admin in Discord or Steam, found on the league table. The help channel in Discord is also a very good option.